Voltaire (1694-1778) historian, philosopher, satirist and wit. The enlightened, versatile writer is sometimes described as having also been an irreligious forerunner of the French Revolution. But this would be an error and of no credit to him. He was neither irreligious nor intolerant to religion. His views were very advanced for his time, certainly with regard to the French absolutist system. He advocated freedom of expression, freedom of religion, and above all he believed that State and religion should be totally separate. His attacks against religious dogma, religious intolerance and monarchial absolutism stoically sustained then by the Catholic Church, was to cause him legal problems, imprisonment and exile on several occasions during his life. Ironically he had the opportunity to write his first successful play 'Œdipe' during an eleven month period of imprisonment in the Bastille. It was this work that established him as a controversial writer, philosopher and playwright. Voltaire was in fact his nom de plume. His real name was Françoise-Marie Arouet. 'Voltaire' is an anagram of the Latin version of Arouet (AROVET LI). There is a further reverse order connotation between the regional name of 'Airvault,' in Poitou where the family's château was situated. To avoid further imprisonment without even the right of a trial resulting from his response to a French nobleman's insult, the latter having the advantage of his family's being able to obtain a royal warrant for Voltaire's arrest, he suggested that he be exiled to England. This was accepted, and the opportunity of this three year exile as a form of punishmment, again proved to be to Voltaire's advantage. He was intrigued by the British constitutional monarchy which greatly contrasted with the French absolutist monarchy. He also admired the work of Shakespeare, (although later, when Shakespeare gradually became popular in France, The French writer tried to set a counter example with his own theatrical works). Voltaire was also a great admirer of Sir Isaac Newton, and this admiration eventually led him to write 'Elements de la philosophie de Newton,' and to try his own experiments. As his views and observations of what he considered then to be a more advanced nation compared to France regarding the defence of human rights and religious tolerance, etc., were considered as treason, the books were burnt, and he was once more forced to make himself as scarce as possible. He fled from Paris and amused himself by restoring the Château de Cirey (Haute Marne) where he lived for fifteen years as the privileged 'guest' of Gabrielle Emilie de Breteuil, Marquise du Chatelet. She too was a renowned intellect and lover of literature. It's recorded that whilst they were together they established an immense library, a collection of over 21,000 books. They thus shared a great deal in common, at least for as long as Voltaire was obliged to avoid Paris. In 1750 Voltaire was invited to Potsdam by an admirer, Frederick the Great. The king even granted him an annual income of 20,000 francs. For Voltaire it was an excellent arrangement, certainly for as long as it lasted. In 1752 during this period he wrote Micromégas. This short story, satirising human nature, or folly) is considered the first example of science fiction in the history of European literature. Voltaire's relationship with the King deteriorated however, especially following Voltaire's 'Diatribe du docteur Akakia', a satire of the theories (and power abuse imposed upon a mutual acquaintance) of Maupertuis, president of the Berlin Academy of Science. It was also written after an argument between Voltaire and Maupertuis. Consequently Frederick had all the copies burnt and even had Voltaire arrested. Banned by Lewis XV from Paris, Voltaire bought a large estate ('Les Délices') near Geneva. The laws of Geneva at that epoch were not favourable to Voltaire because performances of plays were banned. When the osé poem The Maid of Orleans was published without his authorisation, (the version should never have been published in the first place, and he rewrote the poem thirty years later) Voltaire decided to return to France, over the border to Ferney. It was there, in an even grander estate he purchased, where he wrote Candide ou l'Optimisme (1759) a satire of the philosophy of Leibniz, for which Voltaire is perhaps most well known. It was in Ferney where he received eminent guests such as James Boswell, Adam Smith and Giacomo Casanova, amongst others. 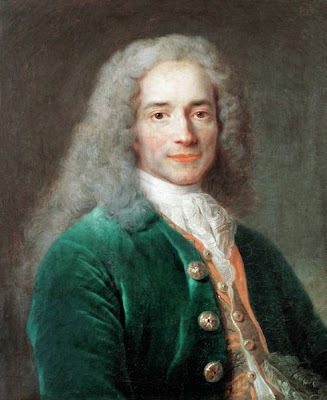 Voltaire became a defender of victims of injustice, of which the Jean Calas case was the most famous. Voltaire succeeded in annulling the charges on the grounds of religious persecution, although for Jean Calas, only his ghost would have been comforted. His best known philosophical work, Dictionnaire Philosophique was published in 1764. He was 83 years old when he returned to Paris in 1778. He wanted to see the performance of Irene that was being staged there. The tiring voyage in February was almost fatal, but he recovered enough to see the performance the following month. The audience appreciation and ovation was the equivalent of a fond welcome to a returning hero. In many ways he certainly was a hero. He died two months later on the 30 May. Considering the rumours surrounding his criticism of the Church, of his alleged repenting on his death-bed, accepting the last rites, and other such fabulations; (including a far more credible account of a stupid, sectarian Catholic priest beseeching Voltaire to renounce Satan, and Voltaire's final words in way of reply : 'Now is not the time for making new enemies'...) the letter written by Boswell following these two abridged biographies, is all the more enlightening. 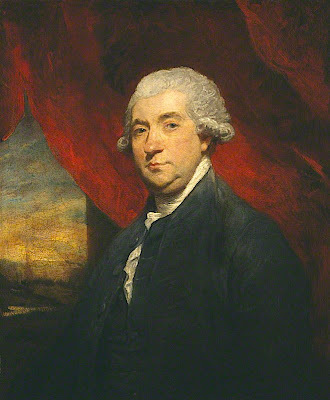 James Boswell (1740-1795) also had an interesting personality. He was a lawyer, though never a brilliant one, perhaps because his father pushed him into law, when he was more devoted to literature and the arts. Of course, he is far more renowned as an author and a diarist, than he ever was as a lawyer. He was born in Edinburgh. His father (Alexander Boswell, Lord Auchinleck) was a judge, and his mother a Calvinist. They were therefore both strict. He was the eldest son and heir, but suffered from an recurring nervous complaint, probably inherent, which he had to contend with all his life. He studied art when he was thirteen, at the University of Edinburgh (1753-1758) but was afflicted with a serious depression during this period. When he finally recovered however, he was stronger and in much better health and humour than he had ever previously been. When he was nineteen, he continued his education at the University of Glasgow, and was fortunate enough to attend the lectures of Adam Smith. Whilst there he converted to Catholicism and even planned on becoming a monk. When his father heard about this he was furious, and demanded that James return home at once. His son rebelled however, by going to London where he enjoyed the life of a rake for three months or so. This resulted in his having to sign away his inheritance for a relatively modest yearly allowance, and return to Edinburgh where he had to continue his studies at the University before taking an oral law exam in 1762. As he successfully passed his exam, his father doubled his annual allowance to £200 and consented to his returning to London. Boswell continued to study law in Holland for a year (Utrecht University). Whilst there he fell in love on two occasions. Then he spent two more years exploring Europe. He even made a pilgrimage to Rome with Jean-Jacque Rousseau. He also travelled to Corsica where he met Pasquale Paoli whom he greatly admired. All this was well recorded in his diaries, later compiled into two volumes (Boswell in Holland, Boswell on the Grand Tour). Although on his return to Scotland Boswell passed his final law exam and practised as a Lawyer there for ten years, he was far happier in London with Johnson and the literary circle of friends, as well as with the bawdy night-life which caused him to contract venereal disease several times. James Boswell was to become quite involved in the cause of Corsican independence. He thoroughly supported the Corsican Republic He even organised the sending of arms and money to the Corsican fighters, but they were finally defeated by the French in 1769 (La Bataille de Ponte Novu). There seems to be a similarity beween Boswell and Pepys, both of whom were diarists in the habit of having liaisons with other women (including prostitutes in Boswell's case), and both of whom would too often tearfully beg forgiveness from their respective wives. Boswell was married in 1769 to his cousin Margaret Mongomerie. Unlike her husband she always remained faithful to him. She died from tuberculosis in 1789. They had four boys and three girls.Two of the boys died in infancy. Boswell also had an extramarital girl and a boy. Boswell's swings in mood, habits and vices might indicate that he was bipolar. His saving grace however was his charm. He had humour and a pleasant nature. (The terms Boswell, Boswellian, Boswellism, signifying a companion and a recorder of observations, were adopted by the English language for a considerable period of time. Well over a century following the death of the diarist, Arthur Conan Doyle, for example, would sometimes use 'my Boswell' to designate Watson). In view of the background of both personalities, the social and political differences between Great Britain and France in the 18th century, prior to the French Revolution, the rumours created by false religious bigots, the interest both men took in various causes in divers locations; it's interesting to compare them. For this reason I thought it perhaps necessary to add their abridged biographies as a backdrop to the short, most sincere and revealing letter written by James Boswell to W.J. Temple that I discovered it in an old edition of A Book of Scotland. The letter was published under the title of 'Boswell and Voltaire'. Nothing has been changed. 'At last we came upon Religion. Then he did rage. The company went to supper. M. de Voltaire and I remained in the drawing-room with a great Bible before us; and if ever two mortal men disputed with vehemence we did. Yes, upon that occasion He was one Individual and I another. For a certain portion of time there was a fair opposition between Voltaire and Boswell. The daring bursts of his Ridicule confounded my understanding. He stood like an Orator of ancient Rome. Tully was never more agitated than he was. He went too far. His aged frame trembled beneath him. He cried, "O, I am very sick; my head turns round," and he let himself gently fall upon an easy-chair. He recovered. I resumed our Conversation, but changed the tone. I talked to him serious and earnest. I demanded of him an honest confession of his real sentiments. He gave it me with candour and with mild eloquence which touched my heart. I did not believe him capable of thinking in the manner that he declared to me was "from the bottom of his heart." He exprest his veneration- his love- of the Supreme Being, and his entire resignation to the will of Him who is Allwise. He exprest his desire to resemble the Author of Goodness, by being good himself. His sentiments go no farther. He does not inflame his mind with grand hopes of the immortality of his soul. He says it may be; but he knows nothing of it. And his mind is in perfect tranquillity.